The eastern indigo snake (Drymarchon couperi) is a large (up to eight ft. in length, average length six to seven ft.) bluish/black snake found in the extreme southeastern United States. Its range has been severely diminished. It is now only found in disjunct populations in the peninsula of Florida and southern Georgia. It is extirpated from southern Louisiana, Mississippi, Alabama and the Florida panhandle. Some repatriations have been conducted in the last few years in southern Alabama with moderate success. The eastern indigo snake has been a federal and state listed (protected) species since 1978. The eastern indigo snake was once “common” on Sanibel and Captiva Islands. Observations really started to taper off in the late 1980s and the last known indigo snake was hit by a bicycle on the Indigo Trail (a trail named after the indigo snake) on the J.N. “Ding” Darling National Wildlife Refuge (JNDDNWR) in February 1999. That snake died at C.R.O.W shortly after. Surveys, trapping protocols, and educational programs asking island residents to document new specimens have failed in verifying any remaining snakes. The snake appears to be extirpated from Sanibel and Captiva islands. The reason for its demise on our islands is mostly from getting run over by vehicles on roads. The eastern indigo snake has the largest home range of any snake found in the United States. The home range of males can be up to two miles (females are a bit smaller). These diurnal snakes can travel a long distance in a given day and are prone to crossing roads frequently. One by one these snakes were hit by vehicles while crossing or sunning on roads until there were not enough snakes to continue the race. Also, this snake is a winter breeder. Unfortunately, they are searching for mates and covering a lot of territory while traffic is at its peak on the islands. Indigo snakes are fond of upland areas with gopher tortoise burrows. They tend to sleep and seek cover in gopher tortoise burrows. These sun loving snakes are fond of open grasslands and the edge of hammocks. As the island became infested with exotic trees such as Brazilian Pepper (Schinus terebinthifolius) and Australian Pine (Casuarina equisetifolia) throughout the 1960s-1990s, the once open landscapes were minimized and the snakes began spending more time in the remaining open and sunny areas along the roads. 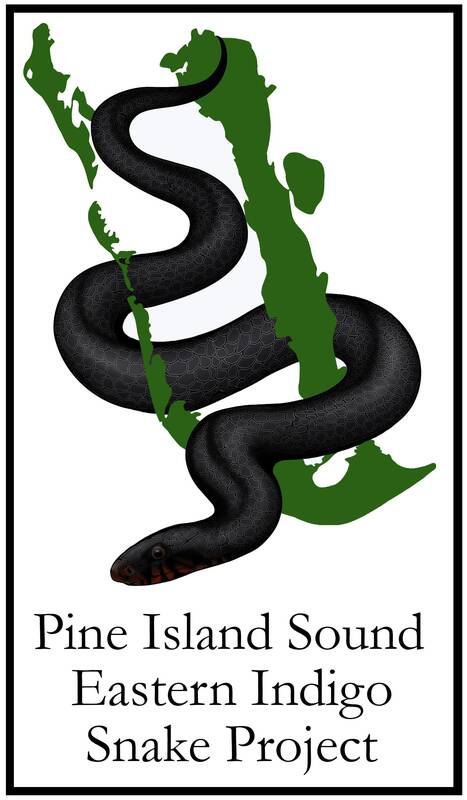 SCCF has partnered with a non-profit organization called the Orianne Society (an organization dedicated to the conservation of the eastern indigo snake) to help assess the remaining populations of the eastern indigo snake in Pine Island Sound. The Wildlife Habitat Management staff at SCCF has begun inventorying eastern indigo snakes in the area. JNDDNWR and the Florida State Park system are collaborating with this research. Residents of Upper Captiva have lent their enthusiasm for the project, with volunteer time and covering the expenses through SCCF’s North Captiva Conservation Fund. Most have come to realize how fortunate they are to live on an island where this animal’s population is still viable. The snakes are being pit-tagged and measured so a population estimate can be made and movements can be documented. Indigo snakes are still present on North Captiva, Cayo Costa, Pine Island and possibly elsewhere. These populations appear to be the last barrier island populations known to science. The main reason that indigo snakes are able to survive on North Captiva and Cayo Costa Islands is the lack of busy roads and full size vehicles, with most of both islands held in state park land with large unbisected tracts of land.The first eastern indigo snake from North Captiva (and the first of this project) was brought to C.R.O.W. by SCCF staff on February 6, 2012 because of unknown injuries. After a remarkable recovery at C.R.O.W., it was released by SCCF on April 19, 2012 back to its site of origin. The Orianne Society asks that indigos be given names and the person who found the injured snake on North Captiva chose the name, Kurt. We are looking for people to take pictures of any indigo snakes that they observe in the area (without disturbing them of course) and to record their location and report them to SCCF. Indigo snakes resemble the very common southern black racer snake (Coluber constrictor priapus), and dark specimens of the Florida watersnake (Nerodia fasciata pictiventris), so be aware that there are other black snakes in the area. For more information or to report a sighting please email indigo@sccf.org or call the SCCF Wildlife Habitat Management office at 239-472-3984.